2 layers of soft bamboo terry, with extra padding, and an opening to form pouch at the back. Two layer bamboo loose booster for stuffing in pouch. Very slim fitting, ideal from birth. Popper fastening, with overlap for smaller sizes. Elastic at waist and legs for good containment. Wash at 40 or 60 can tumble dry on low. One size, poppers down on front to fit from birth to potty. Wash at 60 can tumble dry. Size 2 can be used as birth to potty by adjusting poppers on the front. No fastenings, secure with Nappi Nippa or pins. 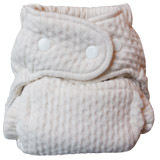 Choice of soft one size or newborn Organic Terry nappy. Very slim fitting, not bulky on newborn. 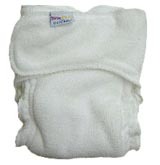 Made from white absorbent 100% polyester microterry, with a short loop pile. Inner lining of soft white 100% cotton jersey (Tshirt fabric) , so that a natural fibre is next to baby's skin. Lightweight and slim fitting, yet microterry fabric is more absorbent weight for weight than cotton towelling. Quick drying, can be air dried or tumble dried for fastest results. Without fastenings for use with Nappi Nippa for best containment. Size 2 to fit from birth to Toddler for use from birth by folding down. Very popular nappy of stretchy terry fabric. Choice of white or unbleached, Bamboo, Organic or StayDry - unbleached with polyester stay dry liner on top. Has wide soft elastication round legs and waist, giving very good containment. 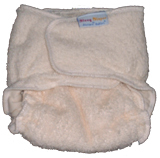 Optional snap in liner for additional absorbency usually required for older babies. Wide between the legs so may look bulky on small babies. Popper fastening across front at waist, wider at back than Popolini nappy (below). May get outgrown by larger/later potty training babies, but is fine for most babies. Made in Canada. Sorry we can only sell Mother-ease products within UK.